As I promised a few pictures from the dig. This post mainly holds pictures, a little more info about the excavation is available in the last post. The site seen from the east with dome’s church tower in the background. The site seen from the south, the medieval structures are in the south part of the picture. The northern part holds structures we believe are from the 17th or 18th century. A medieval brick with stamps that has been reused in the newer structures. 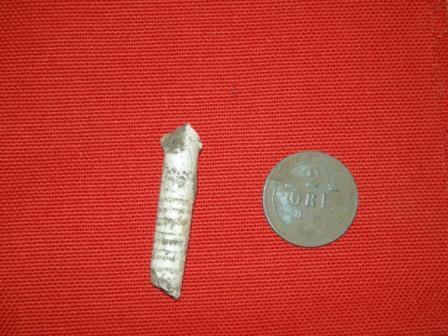 A few of the finds, a part of a clay pipe and coin from the 1890’s; 2öre. 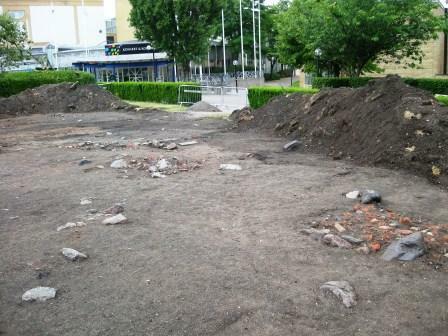 On Thursday we started the excavation at Konserthusparken in Linköping, the excavation area is somewhere around 300 m2. 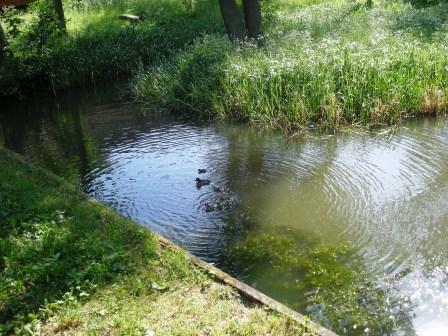 The area can be dived into two parts; a southern and a northern area. 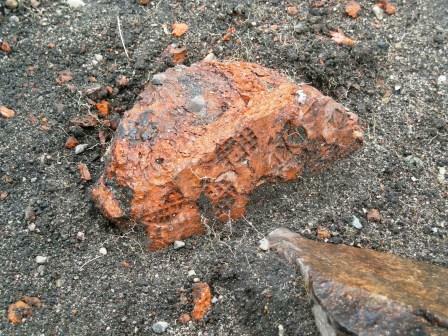 In the northern area structures dating to the 17th or 18th century have been uncovered. 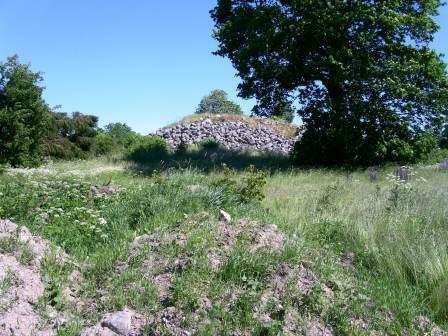 The remains are sill stones and remains of cairns of the smelting oven. We believe that the smelting ovens have been used for iron smelting, glass manufacturing etc. 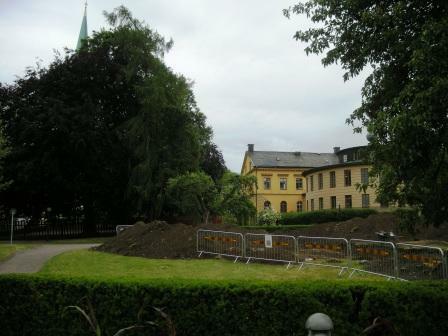 These structures were probably somewhat temporary, perhaps in connection with the rebuilding of the nearby dome of Linköping in the early 18th century or the building of the “new” the Bishops mansion in the 17th and 18th century. In the southern area we have uncovered remains of a few walls that we believe can be of medieval decent. In the 60’s a cellar dating to middle ages was excavated just a few meters away and we hope that these walls my be connected to this cellar in some way. The first few days we have been opening up some space around the structures found during the preliminary investigation/excavation and widening the excavation area. This has been done to be able to do measurements and to take photos of the structures. During this work we’ve found a lot of animal bones, mainly from pig and cattle but also from dog, hare and some birds, a lot of ceramic shards from the 17th -18th century, parts of clay pipes and a lot of handmade nails and such. On Monday the real excavation work will begin.Unfortunately I forgot my camera so I don’t have any photos from last week , but I’ll be sure to bring it along this week. 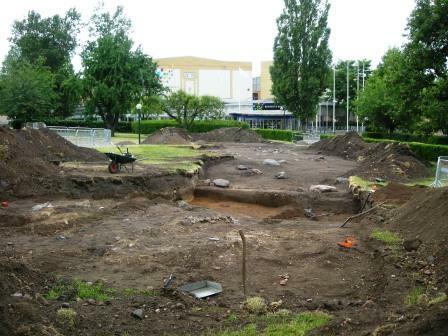 The excavation is being done by Östergöland County museum. I’m eastbound for three week as I will participate in an excavation in Linköping for Östergötland (The eastern part of Götaland) County museum. The excavation concerns structures, parts of walls etc, of one or more buildings from the Middle Ages. More news on this as I get them. Today we celebrate Midsummer’s Eve in Sweden. The origins of the midsummer celebration is prehistoric, but exactly how old isn’t possible to say. The oldest written source are the Icelandic sagas written during the 13th century where it is said that Olav Trygvasson, a Norwegian king during the final years of the 10th century, abolished the sacrificial beer and instead replaced this with feast beer during Christmas, Easter and Midsummer. 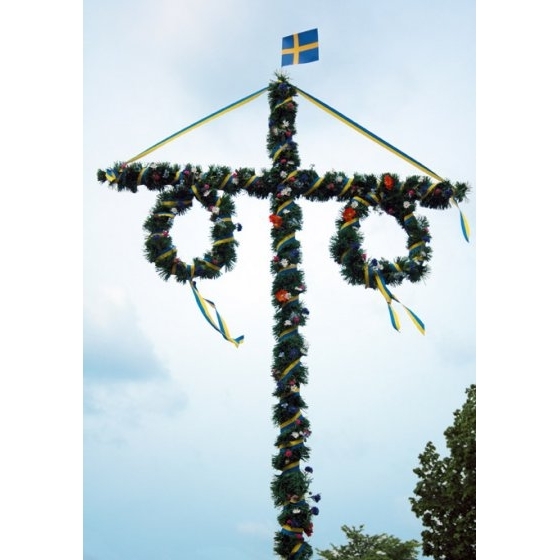 Traditional feasting demands a midsummer’s pole, a cross dressed in flowers and leafs that one should dance around wearing a garland of flowers. A feast also needs food, for many this means new potatoes and pickled herring for lunch and a barbecue at night. This is accompanied with aqua vitae, vodka, beer and wine. While drinking of hard liqueurs, in this case most often schnapps, is often combined with another tradition; drinking songs. Me I’m not much for the pickled herring but I love the rest. This year we will celebrate with a bunch of friends and their relatives and friends just south of Enköping. They hold a “traditional” (in the sense that they have done so for many years) masquerade at Midsummer, this years theme is Vikings. I will attend as the monk Anskar who is also known as the apostle of the north. In reality he was a monk, a missionary and the arch bishop of Hamburg-Bremen, which included Denmark, Norway and Sweden. Anskar was born in 801 AD and died 865 AD. His successor Rimbert wrote his biography called Vita Ansgari. 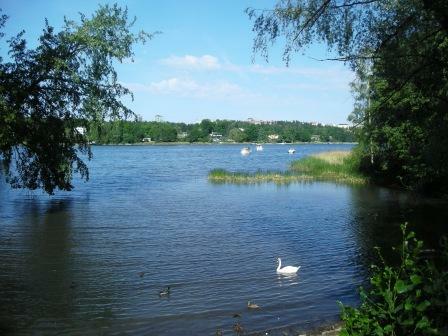 Where one can read about his two visits to the Viking age city Birka in lake Mälaren some miles west of Stockholm in 829 and 850’s AD. My fiancée will come as my counterpart a heathen or to frank as a sacrificial tree. Together we come as a symbol of the faiths and the war of faiths of that time. More info on Midsummer’s Eve is just a click away. I wish you all a happy Midsummer’s Eve I’m pretty sure I will. Just a few kilometres away from home is the royal Palace Ulriksdal, it is situated at the brink of Edsviken just east of Bergshamra (where I live). 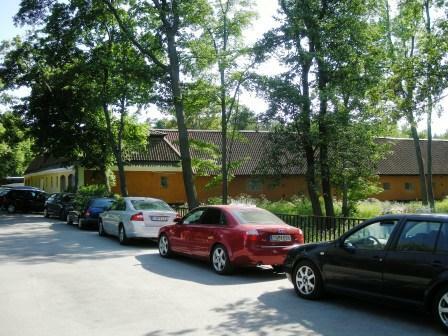 As a student at the Osteoarchaeological research laboratory (OFL) at Stockholm University I spent two years here as the laboratory at that time was situated in one of royal stables. Today OFL is no longer at Ulriksdal and can now be found at the Wallenberg laboratory, Stockholm University campus. In this building OFL was situated until 2003. The surroundings hold many scenic spots both of cultural historic importance and due to beautiful nature scenery. 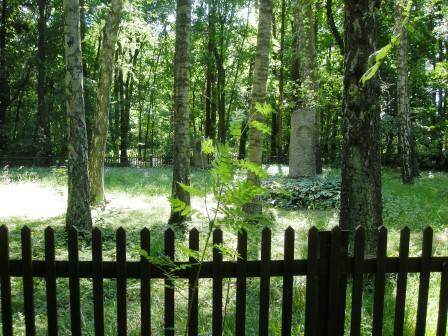 As one walks from Bergshamra one passes a cemetery for soldiers that became invalids during wars between 1788-1814. King Karl IV Johan made Ulriksdal available for veterans that had been injured during these wars, thus Ulriksdal served as a nursing home between 1822-1849. In total 383 officers, soldiers and enlisted men lived and were taken care of at the castle. The cemetery was founded in 1824 and is the final resting ground for some 200 men. A small part of the cemetery is enclosed and except for five tombstones the graves are unmarked. The palace was built during the 17th century by field marshal Johan De la Gardie and was then named Jacobsdal. 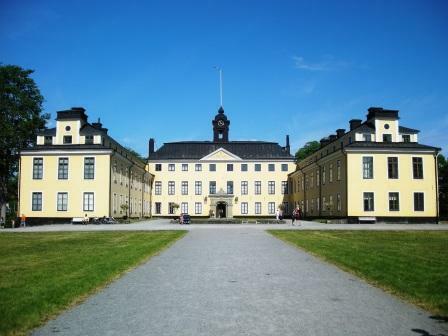 When Queen Hedvig Elenora acquires the castle in 1684 the name is changed to Ulriksdal. The exterior of the palace today is from the mid 18th century. As time have passed several kings and queens has made changes and added to the castle and the surroundings. This very obvious if one takes the tour of the castle, where different periods of its history are displayed. One of the interesting things is one of Stockholm’s first living rooms. 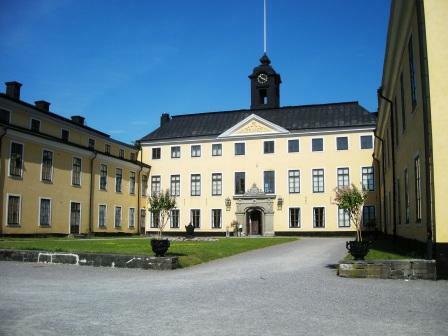 It is designed by Carl Malmsten for the crown prince Gustaf VI Adolf in the 1920’s. 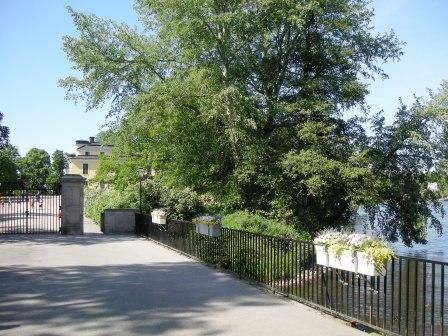 The castle park was originally created during the second half of the 17th century, within the park is the Orangery and several sculptures by artist such as Carl Milles and Pehr Henrik Lundgren. 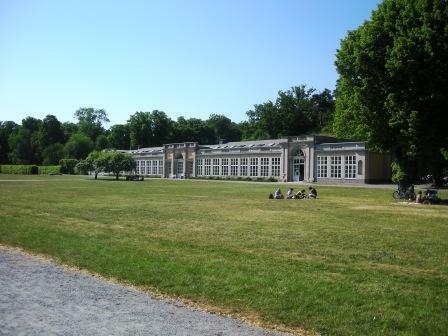 The Orangery is a building from the beginning of the 18th century by the architect Nicodemus Tessin the younger. 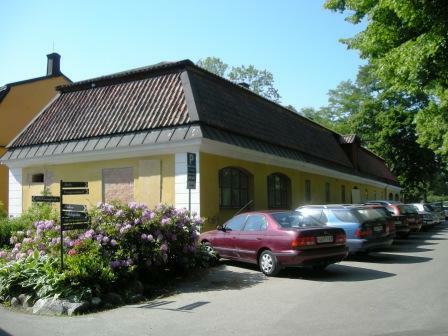 It was restored in 1987-91 and works as a museum for art by Swedish sculptors such as Tobias Sergel, Bengt Erland Fogelberg, Johan Niklas Byström and Christian Eriksson. 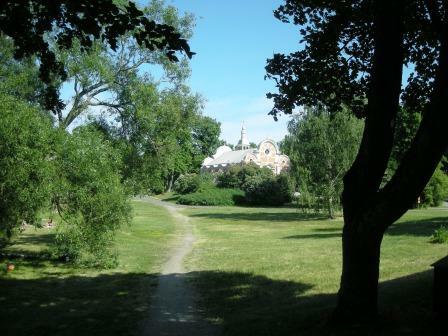 Another buildings is the Ulriksdal royal chapel, it was build in the 1860’s by King Karl XV. It is a popular spot for weddings. At Ulriksdal is also one of Sweden’s oldest preserved theatres; the rococo theatre Ulriksdal royal theatre aka the Confidence. The theatre was built by Queen Lovisa Ulrika and was opened in 1753. Sorry to say I have no picture of the theatre at the moment. Across the theatre is Ulriksdals inn (Värdshus) the building is from 1867 and the food and environment is great. 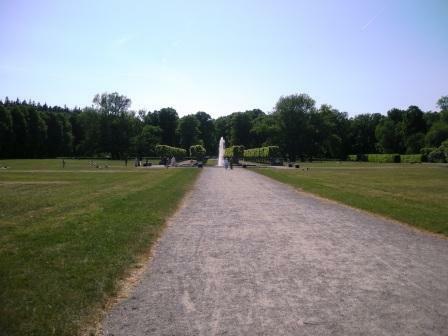 And to finish this post a few pictures of the surroundings at Ulriksdal. Is an UFO landing site an ancient remain or monument ? – Yes, according to the National Heritage Board (NHB). Strövelstorp 47:1, Skåne (Scania) near Ängelholm. A monument, consisting of an inclosed, level surface, 22 meters in diameter. 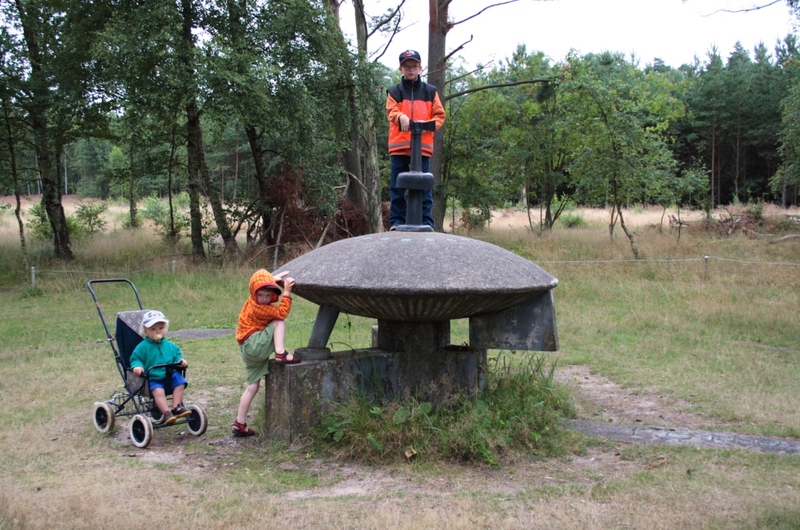 In the center of the area is a model of a space craft (a flying saucer) made out of concrete and bronze. The model is made in the scale 1:8 according to information received. 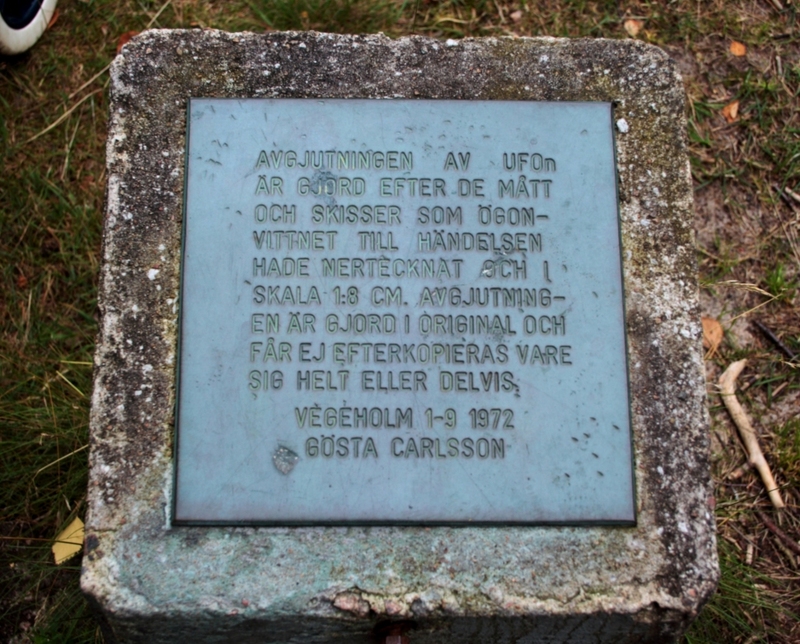 In the area are cast concrete placed in the markings left by the space craft while landing and starting may 18th 1946. The informant claims to be an eyewitness of the event. Check out the photos here and here. When one studies large databases one will always find odd files or postings such as this. Though I think they are fun I am not sure that they really have a place in register such as FMIS, but it is sure one for the conspiracy theorists out there; the government hides UFO-information among filings of ancient monuments and remains. 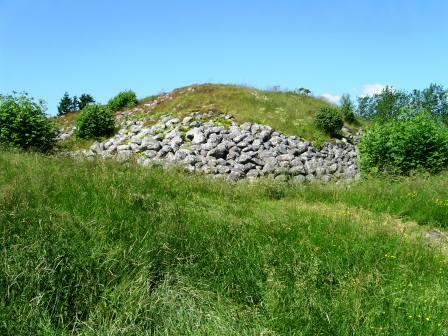 At this trip I also visited two monumental prehistoric burial sites; Skalunda mound and Stenkullens cairn. 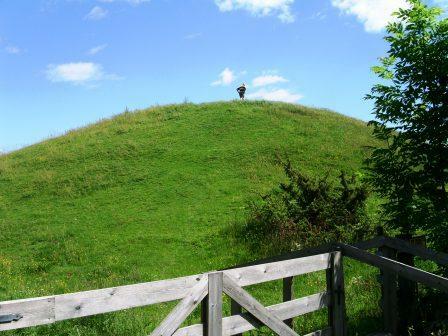 Skalunda mound is situated on a ridge in Kållands plains; it is one of largest mounds in Sweden with a diameter of 65 meters and measures 7 meters in height. It was investigated with the use of subsurface radar and an earth drill in 1994. The result gave evidence for a dating to the 8th century AD. 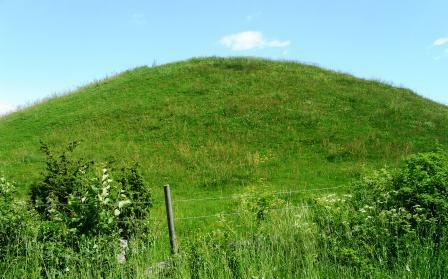 It also showed that the mound held an inner cairn that has been over layered by several layers of turf. Next to mound is a circle of erect stones a so called domarring. These are normally dated to ca 400-550 AD in Västergötland. Unfortunately I don’t seem to have a picture of this. 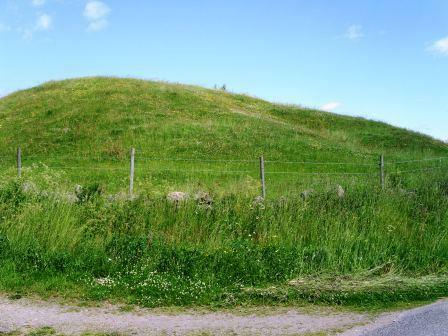 Stenkullens cairn is most probably from the Bronze Age (ca 1800-500 BC). Today it is ca 60 meters in diameter and measures ca 7 meter in height and is one of the largest in Sweden. It has originally been larger than this but through out time stones has been taken from the cairn of the locals. In the middle of the cairn is most probably a stone cist where one or several people have been buried. By the cairn are other prehistoric remains of among others a prehistoric settlement, a sacrificial well and a medieval farmstead.